Animals have found themselves in the path of peril and at the heart the some of the biggest news stories over the past twelve months, from the Japanese tsunami and Bangkok floods to the war in Libya and the droughts in Africa. While some animals have been sent into the danger zone, the majority of these creatures have simply had the misfortune of being in the wrong place at the wrong time, victims of circumstance, and at the mercy of nature’s wrath or man’s violent feuds. When U.S. special-forces stormed a compound and killed al-Qaeda leader Osama bin Laden, the story behind the story was that of the anonymous four-legged member of the eighty-strong team: a bulletproof vest-wearing K-9 military working dog that had taken part in the raid. Elsewhere, the mascot dogs of the Athens protests—Kanellos, Louk and Loukanikos, or”Sausage”—have been photographed countless times amid the protests. The subject of the online world’s attention, the canines have a dedicated Facebook and Wikipage, and are featured in numerous YouTube videos. The average animal doesn’t make headlines, but countless creatures have been photographed amid the chaos and destruction so widely connected to some of the year’s biggest stories. Here, LightBox looks back on a few furry friends who’ve found themselves in harm’s way in 2011. This entry was posted in Contemporary Photography, Uncategorized and tagged Afganistan, animal pictures, Animals, Australia, bahrain, bird, Brazil, Bulletproof Vest, Canines, Cat, Chaos And Destruction, Chernobyl, Contemporary Photography, Countless Creatures, Countless Times, Danger Zone, deer, Disaster, dog, Droughts In Africa, Earthquake, Egypt, Facebook, Feuds, flooding, Furry Friends, Japan, Kenya, Libya, Man on the Wire, Misfortune, New Mexico, nuclear, Osama Bin Laden, Peril, Photographer, Photographers, Photographs, Photography., Qaeda Leader, Sheep, snake, Soliders, Special Forces, Texas, Time Victims, Tsunami, Victims Of Circumstance, West Bank, wild fire, Working Dog, Wrong Place At The Wrong Time, Youtube Videos on December 28, 2011 by Phil Bicker. 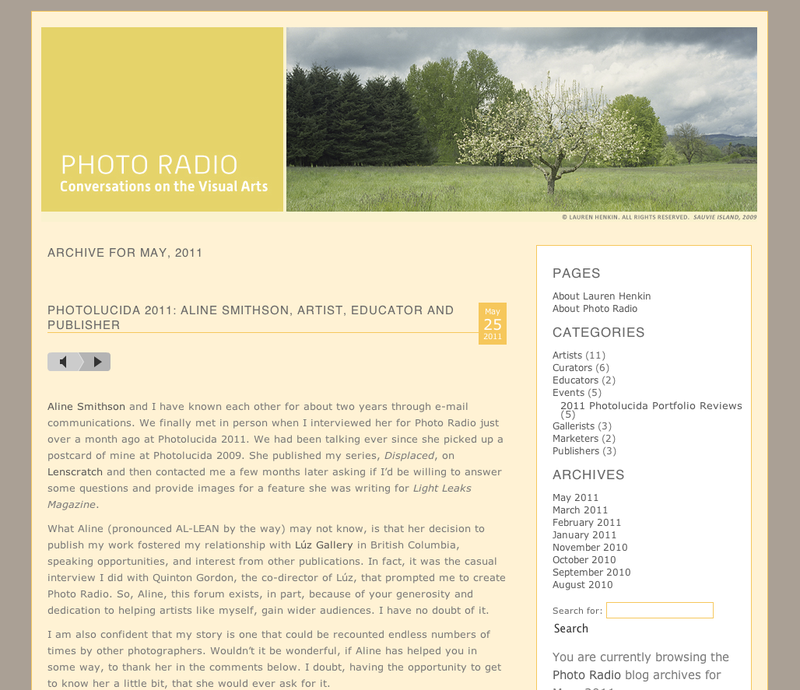 I try to keep posts about my own photo career to a minimum on Lenscratch, but wanted to acknowledge the terrific Photo Radio blog by Lauren Henkin, and a series of recent interviews she conducted at Photolucida, one of which, was with me! Other interviews conducted at Photolucida are with Melanie McWhorter from photo-eye, photographer Cat Gwynn, and Fraction Magazine’s David Bram. There are more to come, and be sure to book mark this site for future good listening! This entry was posted in Contemporary Photography, L E N S C R A T C H, Uncategorized and tagged Book Mark, Cat, Contemporary Photography, Fraction, Henkin, Mcwhorter, Melanie, Photo Career, Photographer, Photographers, Photographs, Photography., Photolucida, Radio Blog, S David, Terrific Photo on May 30, 2011 by Aline - lenscratch.blogspot.com/.